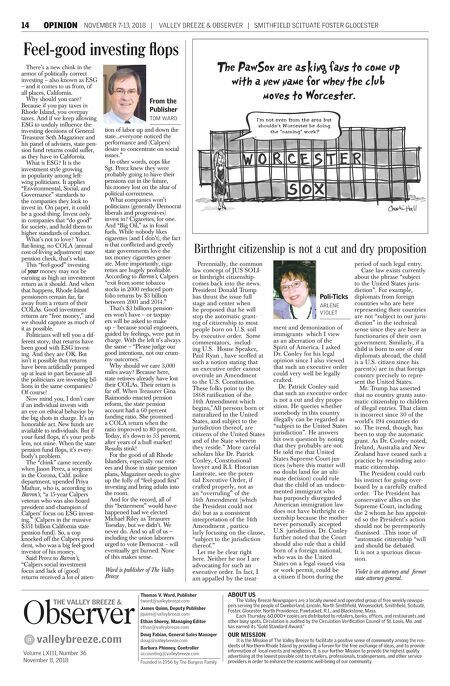 SMITHFIELD SCITUATE FOSTER GLOCESTER | VALLEY BREEZE & OBSERVER | NOVEMBER 7-13, 2018 LETTERS 15 Why charge so much for a key card? When does a nonprofit organiza- tion or facility stop being nonprof- it? Does anyone know? I'll tell you why I ask. Recently, a resident in a senior housing facil- ity lost her key card allowing her access to the building, and with that key card, the key to her apart- ment door. In order to replace those, the resi- dent was charged $45; $35 for the key card and $10 for a duplicate key. And what's worse, nowhere in all the information paper- work given to residents are those amounts listed. There are question marks in place of price. Now any of us can have a dupli- cate key made for around $3, less or more depending on where one decides to shop. And key cards cost $65 for a box of 25 ($2.60 per card). So where does one come up with a price of $35 for a key card and $10 for a duplicate door key? Is the resident being punished for care- lessness? Or is the resident an easy mark because of her age? Granted the key card had to be programmed, but wasn't that done long before the resident lost hers? After all, the management must have a decent supply of programmed key cards on hand, especially for new residents. Or is the resident being charged $32 to program a card, since the card itself, remember, cost around or less than $3. So again I ask, when does a non- profit organization or facility stop being a nonprofit, because the facil- ity I refer to just made a good prof- it from an elderly resident's loss. M. GEREMIA Smithfield BREEZE PHOTOS BY BILL MURPHY Sgt. 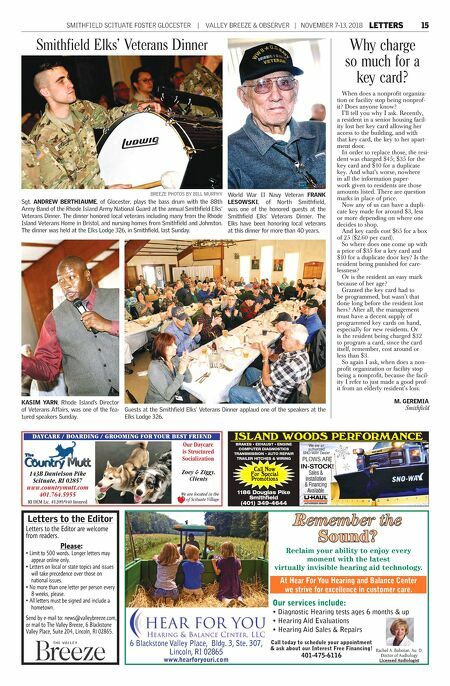 ANDREW BERTHIAUME, of Glocester, plays the bass drum with the 88th Army Band of the Rhode Island Army National Guard at the annual Smithfield Elks' Veterans Dinner. The dinner honored local veterans including many from the Rhode Island Veterans Home in Bristol, and nursing homes from Smithfield and Johnston. The dinner was held at the Elks Lodge 326, in Smithfield, last Sunday. World War II Navy Veteran FRANK LESOWSKI, of North Smithfield, was one of the honored guests at the Smithfield Elks' Veterans Dinner. The Elks have been honoring local veterans at this dinner for more than 40 years. Smithfield Elks' Veterans Dinner Guests at the Smithfield Elks' Veterans Dinner applaud one of the speakers at the Elks Lodge 326. KASIM YARN, Rhode Island's Director of Veterans Affairs, was one of the fea- tured speakers Sunday. Letters to the Editor Letters to the Editor are welcome from readers. Please: • Limit to 500 words. Longer letters may appear online only. • Letters on local or state topics and issues will take precedence over those on national issues. • No more than one letter per person every 8 weeks, please. • All letters must be signed and include a hometown. Send by e-mail to: news@valleybreeze.com, or mail to The Valley Breeze, 6 Blackstone Valley Place, Suite 204, Lincoln, RI 02865. ISLAND WOODS PERFORMANCE BRAKES • EXHAUST • ENGINE COMPUTER DIAGNOSTICS TRANSMISSION • AUTO REPAIR TRAILER HITCHES & WIRING 1186 Douglas Pike Smithfield (401) 349-4644 Sales & Installation & Financing Available We are an authorized SNO-WAY Dealer PLOWS ARE IN-STOCK! Call Now For Special Promotions 143B Danielson Pike Scituate, RI 02857 www.countrymutt.com 401.764.5955 RI DEM Lic. #1209/940 Insured We are located in the of Scituate Village Zoey & Ziggy, Clients Our Daycare is Structured Socialization DAYCARE / BOARDING / GROOMING FOR YOUR BEST FRIEND Reclaim your ability to enjoy every moment with the latest virtually invisible hearing aid technology. At Hear For You Hearing and Balance Center we strive for excellence in customer care. Our services include: • Diagnostic Hearing tests ages 6 months & up • Hearing Aid Evaluations • Hearing Aid Sales & Repairs 6 Blackstone Valley Place, Bldg. 3, Ste. 307, Lincoln, RI 02865 www.hearforyouri.com Rachel A. Baboian, Au. D. Doctor of Audiology Licensed Audiologist Call today to schedule your appointment & ask about our Interest Free Financing! 401-475-6116 Remember the Sound?